Today we woke up to thunder, lightening, and rain showers. I am happy for the rain - it hasn't rained since Mother's Day weekend. I don't have to water the plants today. Plus, I am slightly more motivated to get some work done in my office. Which is good, as I have a small grant that I am submitting that is due tomorrow. It is done, now I am just waiting to get some signatures on it and I will be ready to send it off. My husband is a collector. Right now his current collections include robots and bobbleheads. I have not been as much of a collector. Yes, I do have books, and yarn. But I don't actively collect them. For example, if I were to collect yarn I would search out all sorts of different types of yarn - different wools, handspuns, cottons, strange yarn made from different plants, etc. Then I would not use them, but rather keep them for their own sake. Maybe I am splitting hairs here. Anyway, Tuesday afternoon I decided I am going to collect plants. All plants of all different types. I partially feel guilty for planting non-native plants, but really, I love all plants: herbs, cultivated flowers, native plants. Ok - there are a few exceptions - I am not overly fond of stinging nettles and begonias I just don't really like. I also would not collect species invasive to where I live. I just want to be surrounded by a high diversity of really cool plants. I now find myself scheming on ways to increase my plant collection without spending a ton of money - can I take a cutting of oak-leaf hydrangea? What about hosta's? What about the red flowered honeysuckle growing over the fence from my neighbor's back yard? (NOTE TO SELF - check to see if it is considered invasive, as many honeysuckle species are). I am really becoming obsessed! 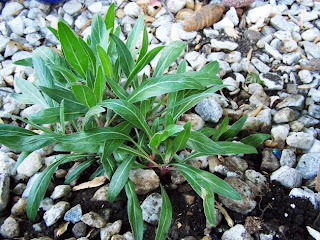 Here is one plant I am thrilled to have in my collection - The Missouri Evening Primrose (Oenothera macrocarpa), the plant I worked on for my Master's Thesis. It does not look like much now, but wait till the flowers open! Actually, I quite like the plant even when it is not flowering. It has nice glossy leaves with that wonderful white mid-rib. Also - red stems and red spots on the sepals of the flower buds.